It is of the utmost importance these days, in reviewing women of historical figures, who gave their lives in contribution to our world. The women written about in these series of articles, are a minuscule spattering of commemorative accomplishments, leaving great footprints in time, for the rest of generations to succeed from. My focus will be more on the 20th and 21st century women pioneers, leaders and entrepreneurs. Starting with the Curie women and their unprecedented works and life’s tragedies. Unparalleled lives, lived with complete dedication and passion. For now, here is a moment of remarkable history in honour of a Queen. Born to Ann Boleyn on September 7th 1533 in Greenwich England. The red haired daughter of King Henry VIII, Queen Elizabeth I, claimed the throne at the age of 25 and held a formidable position for 44 years through political turmoil, religious upheaval while keeping England ascendant through wars. She died in 1603. This is a brief recap of a Queen’s reign, position of power. Her childhood years were absent of a mother Ann Boleyn, by way of her father King Henry VIII with his fervor for yet another woman. Elizabeth excelled in languages and music in her early education. Extensive formal tutoring was conducted after her father’s death in 1547. Both her half-sister Mary and their cousin Lady Jane Grey sought the crown with zealous piety. Elizabeth’s half-brother Edward had appointed Lady Jane to be his successor; her reign proved to be short-lived. Mary gained the support of the English people and unseated Lady Jane after only nine days on the throne. Mary’s reign was known as “Bloody Mary” for her staunch Roman Catholic beliefs ordering the execution of over 300 Protestants as heretics to be burned at the stake; undoing her father’s break from the Pope. Elizabeth was imprisoned by Mary when Thomas Wyatt plot was uncovered, organizing a rebellion against Mary in 1554 wishing to make Protestant-raised Elizabeth queen. Although she disputed any involvement in the conspiracy, her sister Mary remained unconvinced. Soon released, Elizabeth returned to Hatfield and continued her studies. Thomas Wyatt was promptly executed after tortured, never completely convincing Queen Mary of Elizabeth’s innocence. 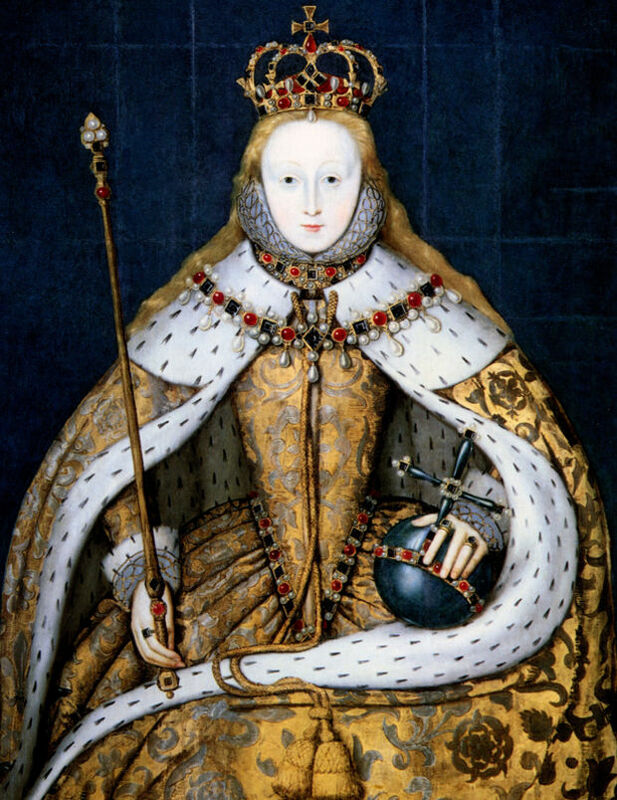 In 1558, after the death of Elizabeth’s sister Mary, Elizabeth took the reins of her country and crown. She inherited numerous problems stirred by Mary. The country was at war with France, proving to be an egregious financial drain on the royal coffers. Adding to the drama of Elizabethan era, Jane Seymour, the Lady who King Henry (for the third time) fell in love and revokes his own religious zeal. Reviling and condemning wife and Queen, Ann Boleyn’s head to be swiftly removed by a French swordsman. Elizabeth I, found Jane Seymour to be guilty for conspiring against the throne in a bid to gain power. Deadly consequences resulted in Seymour’s execution. Acting swiftly during her first session of Parliament in 1559, she called the passage of the Act of Supremacy, which re-established the Church of England, and the Act of Uniformity, which created the common prayer book. Taking a moderate approach to the divisive religious conflict in her country between the Puritans and Catholics. “There is one Jesus Christ. The rest is a dispute over trifles.” While the Roman Catholic Church took a dim view of these words and action, Pope Pius V excommunicated Queen Elizabeth I, for her words alone. In 1567 in connection with several assassination attempts including the Babington Plat, Mary Stuart, queen of Scots Elizabeth’s cousin who had earlier claimed the English crown was imprisoned for nearly 20 years. For her conspiracies, found her own execution in 1587. Ending the war with France, with the assistance of her key advisor, William Cecil, she avoided a clashing with two super power countries Spain and France throughout her reign. Entering a supportive war, the Protestant rebellion against Spain in the Netherland, Spain set their sights on England, nonetheless the English navy defeated the infamous Spanish Armada in 1588. Elizabeth had many suitors for her hand in marriage. Knowing the trials and challenging tribulations of royal marriages, would only oppose Elizabeth talents as a diplomat, managing multiple suitors including king of Sweden, Archduke Charles of Austria and future King Henry III of France, she used her availability as a means in political ends and never agreed to marriage. The arts flourished during Elizabeth’s time with the creation of works by William Shakespeare and Christopher Marlowe. Writers paid tribute to the queen in many literary forms, such as Edmund Spenser character of Gloriana in The Faerie Queen on Elizabeth. Artists honored Elizabeth painting many portraits, revealing her as an early fashionista for her love of beautiful clothing and jewelry. Her garments were often made of gold and silver. Her dramatically pale cosmetic concoction called the spirits of Saturn cause a severe impact upon her health, being a mixture of while lead and vinegar. In the early 1600’s, the end years of Elizabeth’s reign marked trouble times. The country suffered from failed crops, unemployment and inflation. Riots over food scoured the streets, Elizabeth faced many challenges to her authority including rebellions in Ireland, from Robert Devereaux, the Early of Essex after being sent to Ireland to quell the rebellion led by Hugh O’Neill; instead he sought his own rebellion and was executed for treason in 1601. On March 24th, 1603 at Richmond Palace in Surrey, Elizabeth – Tudor, a royal family who ruled England since the late 1400’s had come to an end. James I, the son of Mary Stuart, Queen of Scot son succeeded the throne. Her reign was commonly known as the “Golden Age,” in support of the arts which flourished, navigating with a clever mind and sharp wit through difficult religious and political challenges, she provided her subjects with stability and consistency. I have found an anomaly, the lack of historical facts, of thousands of women, an avoidance in history. Dumbfounded! We have heard of less than 3% of their names and voices, the courage, GRIT, resolute, their lives and accomplishments. What women have born, brought about, discovered, stood up and behind, lived and died for. Women have fought wars, been leaders, aided the sickly, helped the dying, and died doing so. It is time the stories are told and retold. Where are their names in history books? Other than salacious wrongful stories of misuse of position and historical facts. Or, of their worldly charms, which men (claiming victim) and have succumb to. We women have been taught to believe in this biblical sense of shame, from childhood – to the board room. Or, when a woman stands in power or authority over state, country or small business, somehow we do not measure up to some degree of such standards anonymous to mankind. Powerful women are beautiful and imposing figures for many to comprehend, it is time for this covert era to end. In a remarkable authoritative presences, other than the clandestine images where we are not shown as women of influence. I find our times to be pivotal in examining historical feminine value, no matter the position we all have taken.